The snow has melted and the sun has returned to Fairbanks! The Summer’s next batch of visitor’s are beginning to make their way up to Alaska. For many, Alaska is a bucket list destination. The scenery and wildlife call to one’s sense of adventure. While traveling through this vast state, many people make their way up to Fairbanks and wonder ” what is there to do?” to help our new friends out, we have put together 3 of the most popular city stops in Fairbanks. This beautiful building sits along the banks of the Chena River. The building houses several different organizations who work together. 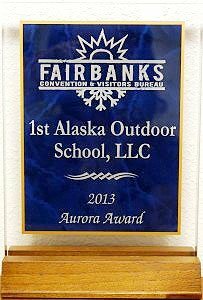 A stop at this facility will give you a great introduction into Interior Alaska. Follow the exhibits as you walk through a year of seasons in Fairbanks. Once you have had your fill with the well thought out displays, make your way over to the Alaska Public Lands Desk to ask any questions you may have or to collect your stamp for crossing the Arctic Circle. The Morris Thompson Cultural and Visitor Center also has staff on hand, through Explore Fairbanks, to answer questions and help direct you to different activities, restaurants and shops. Before you depart the center, make sure to walk around the building to see the historic cabin, garden, mosaic tile displays and the famous moose antler arch. This stop is sure to be a Fairbanks highlight. Located on the University campus, this museum is an architectural standout. From the museum entrance, you have a sweeping view of the valley and the Alaska Range off in the distance. This museum offers the largest collection of artifacts in the state of Alaska. Visit the natural history/Alaska gallery to learn all about the state’s history and resources. As you walk into the gallery, be sure to take a photo with Otto the grizzly bear. While weaving your way through these exhibits, stop at Blue Babe, a preserved Steppe Bison, found in Alaska. In addition to the natural history gallery, there is gallery room that rotates exhibits. Currently you will find a moving exhibit called Decolonizing Alaska. Upstairs houses a collection of native and modern art. A favorite spot among visitor’s is the room where you go to listen. In this room you can hear the sounds of the aurora and the earth beneath our feet. It is a very unique exhibit and something that should not be missed. On your way out of the museum be sure to take a peak in the gift shop for Alaskan made gifts and books/videos about Alaska. This Christmas themed gift shop just finished an impressive remodel. Located in the town of North Pole, the Santa Claus House has the perfect gift/decoration for any Christmas fan. The outside of the Santa Claus House is decorated in murals that are worth a photo. You can also snap a photo of the giant Santa statue that over looks the building. While walking through the shop you can purchase letters from Santa and have them postmarked in North Pole. On certain days when Santa isn’t on vacation or delivering gifts, you can visit this jolly chap and take a photo! Once you’ve had a chance to walk the shop and eat some fudge, head out the doors and walk over to the reindeer pen. Here you can get up close to these magical creatures. There is no shortage of things to do in Fairbanks. Once you start to explore the Golden Heart City and it’s surrounding area, you won’t want to stop! How to dress for the cold!